The Morning Star is a classic drip necklace that brings new depth and technical artistry to a time-tested form. Adorned with a single 3-piece pendent, crafted through a passionate machining process, consider the line between high fashion and mechanical ingenuity blurred. 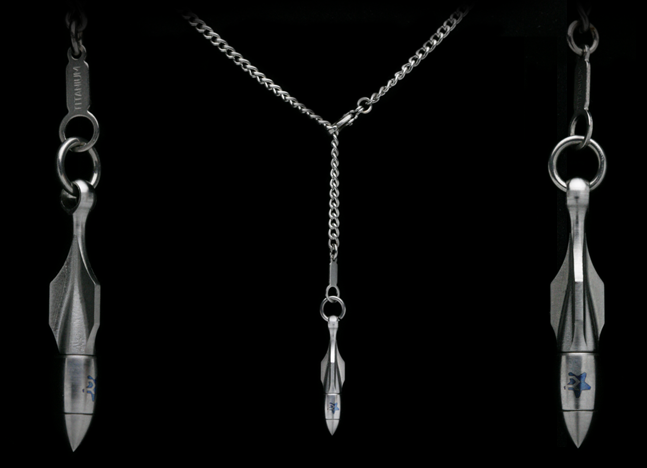 The 20-inch titanium chain allows for adjustable length, enabling multiple visual effects in one necklace. The Morning Star has a suicide number of 20. 'ROGUEDZN', 'ROGUE STATE', 'ROGUE DISTRICT', 'ROGUE MAFIA', 'DARKWORKS' and all other trademarks, service marks, trade names logos, and product names of Rogue Design, LLC. used on this site are trademarks or registered trademarks of Rogue Design, LLC. Inc. in the USA and other countries. Copyright 2015 Rogue Design, LLC. All rights reserved. Log-in to your RogueDZN.com account now! Create your own RogueDZN.com account. How did you find RogueDZN.com? Reset your RogueDZN.com account password. Do you have an account? Login now to view current prototypes. Want to register? Create an account with a valid email address, agree to our NDA (Non-Disclosure Agreement) and you will be granted access to the current Rogue prototypes.